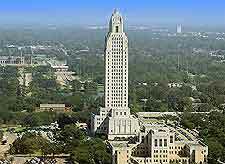 Baton Rouge, capital city of Louisiana (LA) state, is steeped in history and was founded in the early 1700s. Standing alongside the Mississippi River, Baton Rouge is home to an important port, which has brought the city considerable wealth, together with oil and gas. 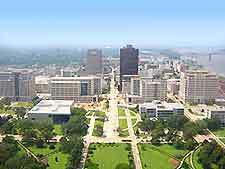 The city contains two large universities, Southern University, and the Louisiana State University (LSU) on the southwestern side of Baton Rouge, around which you will find a particularly lively district, with shops, restaurants and nightclubs. Further tourist attractions are concentrated around the downtown district, off Interstate 110. There are a reasonable selection of hotels in and around Baton Rouge, offering moderately-price lodging and accommodation options. Many major chain hotels can be found off Interstate 10. Further hotels are close to the Mississippi River, with scenic views, around the universities and also next to the nearby Baton Rouge Metropolitan Airport (MKE). 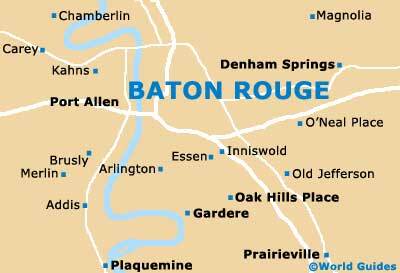 More information about Baton Rouge Hotels. Highland Road is central to life in Baton Rouge and is an important thoroughfare. Nearby Perkins Road also has much to offers tourists, being lined with a wide range of shops and cafés. Tourism is actively promoted in Baton Rouge and the main tourist information office is the Convention and Visitors Center on 3rd Street. The visitors center offers a range of tourism advice, include detailed information about main sights, travel maps, leaflets, events and general travel. Dominating the skyline, the Louisiana State Capitol, an Art Deco skyscraper, is the region's tallest building and one of the most famous landmarks in Baton Rouge, surrounded by vast, formal gardens. The Old State Capitol is an equally impressive building, which overlooks the river and features Neo-Gothic architecture. Dating back to 1850, the building now houses a museum full of historic information about Baton Rouge and Louisiana. Popular tourist attractions in the Baton Rouge area include the famous Casino Riverboats - docked alongside the riverbanks, providing a particularly scenic way to gamble; Blue Bayou Water Park - an exhilarating water park featuring water slides; the Enchanted Mansion Doll Museum - a museum offering a spectacular array of dolls from the 19th century; and St. Joseph's Cathedral - an historic church founded over 250 years ago, providing visitors with a wealth of historic furnishings. Other main tourist attractions in Baton Rouge include Old Governor's Mansion - a spectacular mansion with a wealth of period furnishings and now the headquarters of the Foundation for Historical Louisiana; Magnolia Mound Plantation - a wonderful 18th-century Creole-style house, with a museum which offers information about this bygone age; the Mount Hope Plantation - used as the set for world-famous film Gone with the Wind, a perfect example of a classic antebellum house; and the San Francisco Plantation - a grand 19th-century Louisiana plantation home close to Baton Rouge, featuring an abundance of artifacts, historical information and furnishings from a bygone period. 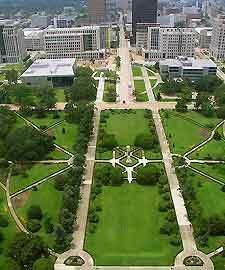 More information about Baton Rouge Tourist Attractions and Baton Rouge Landmarks.